One thing you will notice when you add water the aquascape will look really flat. If you have anymore substrate, maybe add some to the back to get a bit of a slope. Where did you buy the dwarf sag? I am looking at getting some as well. They are very popular in America but I didn't know you could get them here. Where did you buy the dwarf sag? Similar species to consider is H. tenellus 'broadleaf'. Less variation of growth with this one but has the same rampant growth like D saggitaria. Yeah i have heard of that plant. I still want to try dwarf sag as it's fairly easy to grow and always in the top 5 beginner plants. Also dude i sent you a PM earlier today. Check it out when you can. In my tank from 2013, H tennellus was on the front. Grown with no CO2. DIY soil. Last edited by Rebel; 29-01-19 at 05:51 PM. The Dwarf Sag I got was in a Tissue Culture purchased from Nature Aquariums in Mount Albert. They have an online shop I believe. I have seen them in other LFS in Melbourne too and didn't think they were hard to come by. FWIW one box ought to be enough as they grow like crazy. If you can't find any I am happy to send you some of mine. Thanks for the suggestion Slug. I am in deed trying to find some more wood and add more soil. After going through some other posts on the forum, I realized my scape is way too two-dimensional. I was gonna use taller plants at the back to make up for it but it hasn't worked that well in my main tank yet. 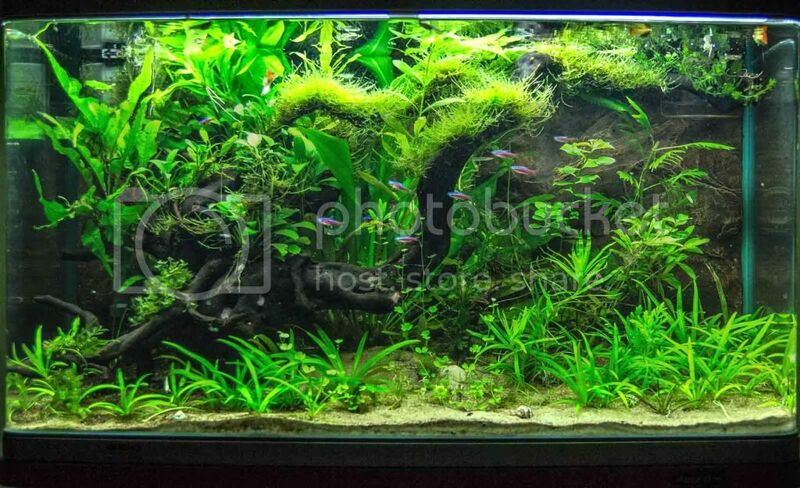 True point regarding depth in your scape. It's kinda too late the change unless you are happy for a complete rehaul etc. I quite like what you did to your Island Dream tank of the same size. The left hand side corner is still quite flat and empty - I was thinking of putting a tiger lily there. What are your thoughts on the layout? Is it salvageable? Aesthetics are up to personal preference. If I were to try and improve this without doing major rehaul, maybe I'd try a nice branchy DW coming out to the open water from your little mountain. You could plant tall crypts at the back perhaps. Maybe a tall plant like val or cypress helferi. As it is, it still looks good though. The HC carpet has finally hit the growth spurt. Proper runners are spreading and the patches are getting noticeably thicker. I am getting impatient however and added another pot of HC tissue culture. This time I spread them real thin and plugged all the hard-to-connect gaps of existing patches. I have added more drift wood and still looking for one or two more branches. I find the cheapest place to purchase DW in Melbourne is Upmarket Aquarium in the city. You can purchase DW right out of their existing tank if you don't mind treating for snails for a completely waterlogged DW for very cheap price. The huntsman hasn't been seen for a week (presumed dead). I added a longhorned beetle for a brief period before I realized DW is literally their favorite type of food. I also plucked four or five species of random moss from my trip to Otway rainforest. Hopefully some can survive when the tank is flooded eventually. Last edited by Orcustus; 06-02-19 at 12:56 PM. Scape also looks taller from that angle. Nice! Thanks for your input on the hardscape Rebel. Really needed a seasoned scaper's help to enlighten my understanding of aquascape. After seeing all the nice tank layouts on the forum now I can't stand my existing 4-footer.